Not being an opera aficionado, I was interested in San Francisco Opera’s adaptation of It’s a Wonderful Life for a number of reasons. First and foremost is the power of the original 1946 Frank Capra movie, a durable staple of the holiday season right up there with Dickens’ A Christmas Carol. The movie was turned into a musical by Joe Raposo and Sheldon Harnick in the 1980s, but its checkered history and mixed reviews have kept it from becoming a holiday hit (although the score’s one standout song, “Christmas Gifts,” is worth a listen: click here). So the prospect of the movie becoming an opera is a mightily intriguing one. After all, the story, about a man contemplating suicide on Christmas Eve, is about as dark as it gets, and we all know opera thrives on thick, juicy darkness, right? Then there’s the composer, San Francisco’s Jake Heggie, probably most famous for his adaptation of Dead Man Walking for the opera stage. Heggie is a straightforward composer who is serious about melody, character and storytelling – in other words, a good candidate for translating Capra’s movie to the stage (and before it was Capra’s movie, it was a short story, “The Greatest Gift,” by Philip Van Doren Stern). It has long been my fervent wish that Heggie would take a few steps down from the opera stage and write a musical, and there are moments in It’s a Wonderful Life that make me wish for that even harder, moments that reveal a musical storyteller with the kind of broader appeal of a Leonard Bernstein or Stephen Sondheim. Those moments come when, in the story of George Bailey and how he ended up nearly taking his own life, the years go by and the U.S. enters World War II and then again at the end, when the notion of community and the essential importance of every individual life turns into a heartwarming, soul-stirring finale. There’s simplicity, beauty and power in these passages, and to my mind, the score could use a few more, but then again, I’m a musical theater nerd. 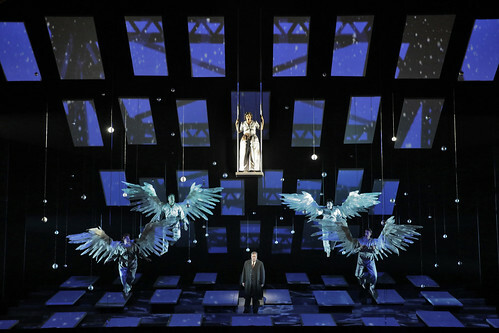 Heggie, working with librettist Gene Scheer, offers a sharp adaptation that doesn’t attempt to recreate the movie but rather builds its own window into the story, or, perhaps the better description is opens a different door into the story. Set designer Robert Brill goes the abstract route, creating a stage full of doors, each one representing a day in the life of George Bailey. There are dangling disco globes (Christmas ornaments? Disco planets?) that give the set a space-age feel underscored by Brian Nason’s lights and especially by Elaine J. McCarthy’s projections. This makes Act One of this two-act, 2 1/2-hour show somewhat ponderous in its expositional attempt to zip through George’s childhood, his courtship with and marriage to Mary and the thwarted wanderlust that makes him feel stuck in and resentful of Bedford Falls. But it does give us a chance to get to know George, amiably played by William Burden, and his lot in life definitely improves with the addition of Mary, played by Andriana Chuchman, whose voice can easily be described as heavenly. Things pick up in Act Two, and the section where Clara grants George’s wish that he was never born is appropriately eerie and devoid of any music. The opera, with its sincere performances and non-schmaltzy approach, definitely earns its happy ending, and even the grinchiest or Scroogiest among us would be hard pressed to resist the sing-along of “Auld Lang Syne” at the end. In other words, the opera, in its own way, gets you where you want to go in terms of existential crisis resulting in holiday cheer. Just for fun, here’s the ending of It’s a Wonderful Life, the 1946 movie. Jake Heggie and Gene Scheer’s It’s a Wonderful Life continues through Dec. 9 in a San Francisco Opera production at the War Memorial Opera House, 301 Van Ness Ave., San Francisco. tickets are $26-$398. 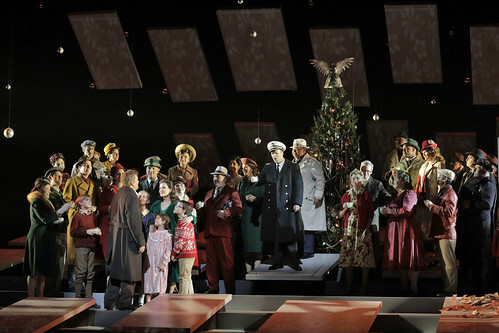 Ca;; 415-864-3330 or visit www.sfopera.com.